Today is Double Feature Friday so I'm looking at two movie adaptations for two very popular fighting games. This is an ad for Street Fighter from 1994. It starred Jean Claude Van Damme as Guile and Raul Julia (in his final peformance) as Major Bison. Also starring was Ming-Na as Chun-Li and Kylie Minogue as Cammy. The movie is notoriously over the top and bad, but fun to watch. Despite the notorious awfulness of this movie, it actually earned triple the cost to make it. Van Damme tried for years to make a sequel but when the property changed over to 20th Century Fox, they rebooted the franchise with The Legend of Chun-Li in 2009. Which is also notoriously bad and considered a worse movie than the original. Street Fighter was written and directed by Steven E. de Souza. Mr de Souza wrote the screenplays for Die Hard, Die Hard 2, Commando, Running Man as well as episodes of the TV shows Knight Rider, The Six Million Dollar Man and Bionic Woman. That sounds awesome, which makes you wonder how this guy could have written this horrible Street Fighter movie. Well, Mr de Souza also wrote Jumping Jack Flash with Whoopi Goldberg, Beverly Hills Cop III, Hudson Hawk, The Flintstones and Judge Dredd. So that's how. 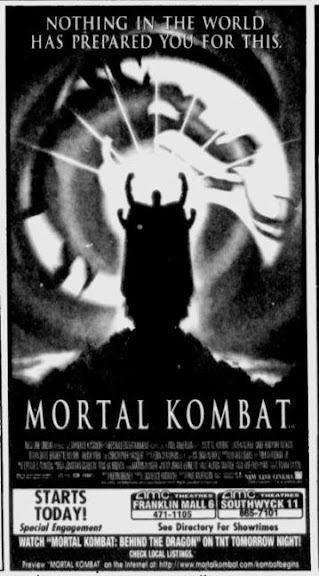 Here's an ad for the Mortal Kombat movie adaptation from 1995. 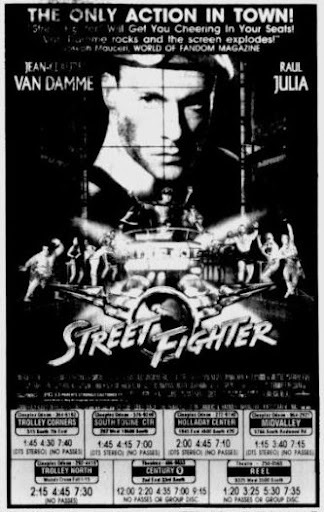 Jean Claude Van Damme was actually offered the role of Johnny Cage in this movie, but turned it down to play Guile in Street Fighter. Linden Ashby would replace Van Damme. Also in the movie were Christopher Lambert, Bridgett Wilson and Robin Shou who played Liu Kang. Robin Shou would reprise his role in the Mortal Kombat sequel, Annihilation. Shou would then jump franchises and play a character in the Street Fighter reboot, The Legend of Chun-Li in 2009.